The goal is to establish electric car networks that allow zero emission vehicles to run on clean energy grids to reduce the reliance on oil. They intend to build an electric vehicle network capable of supporting the switch of Australia’s 15 million gas cars to zero emission vehicles. 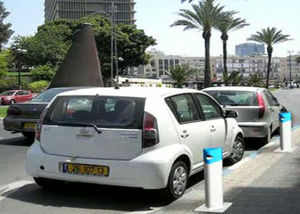 Earlier this year, Denmark and Israel undertook to establish the world's first electric car networks. Australia will become the third country in the world to have an electric car network in a bid to run the country's 15 million cars on batteries powered by green energy under a plan announced in October 2008. Under the plan, charging spots to top up batteries would be located in places where cars park, including home garages, shopping centres and office carparks. The charging spots, which would look like parking meters, would provide cables to connect batteries to a green energy grid, for which AGL Energy will provide power from renewable sources including hydro and wind. On the outskirts of city centres and on freeways, "battery switching stations" would exist for trips longer than 161 kilometres. Drivers could swap batteries to get a longer range for longer trips. Better Place seeks to show that their model works in any country, regardless of size. Better Place has partnered with AGL Energy, with Australia’s largest portfolio of privately-owned renewable generation and Macquarie, well known for making infrastructure investments around the globe. AGL will provide all of the renewable energy—from wind and other sources—needed to power the electric vehicles and work with Better Place to optimize the network. Macquarie will provide financial advice to help raise AUD $1 billion for the initial network build. Better Place also aims to bring a $1 billion electric-car infrastructure system to the California Bay Area by 2012, where leaders unveiled policies on Thursday November 20, 2008 to fast-track the adoption of electric cars. This page was last modified 07:10, 1 March 2009. This page has been accessed 14,491 times.